"Email Your Doc" Anyone can initiate secure message to MDofficeMail user. Go to the webpage, compose and send! HIPAA Compliant Fax service with no hassles !! End-to-End Encryption – Security is strictly enforced with no compromise (unless opted by user the otherway). Messages between MDOM users are plain but secure. Decryption with password not required. "EmailYourDoc" - Anyone can initiate a secure message to a MDofficeMail user. 30-day FREE TRIAL (fully functional) with no obligation. Secure, Efficient, and Economical HIPAA Compliant Email Service! All aspects of compliance are taken care. Email Encryption service for your existing email account including Gmail and Yahoo for end-to-end protection! 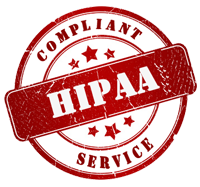 HIPAA Compliant and secure form for your website. Customized header to match your website and customized fields to suit your requirement. The group is having long history of servicing US Healthcare Providers. MDofficeMail is designed out of the experience and expertise of these companies for more than 50 years!! Secure servers of MDofficeMail are located in Illinois and California. Email archives, Data backup, Calendar, File sharing, Access logs, Audit files, Spam control, Virus protection.. Joining our affiliate program requires no upfront costs and no fees! Join and start earning immediately.